$10 million — Did you know that’s how much BlueCross BlueShield of Tennessee donates to health improvement programs each year? We didn’t either until two years ago. But in a state where 33 percent of the population is obese, that’s no small thing. Through these grants, BlueCross finances a lot of life-changing programs, and they wanted to make sure Tennesseans were aware of them. The solution: create a brand to tell that story. And so Better Tennessee was born, with a mission to tell unique, personal stories of the people improving health in Tennessee. To get those to influencers, members and Tennesseans, we know social media would be a key distribution tool. Over the past 2.5 years, we grew Better Tennessee’s social audiences from 0 to 16,000+ followers and generated more than 100,000 website visits. Grow audiences for future engagement. 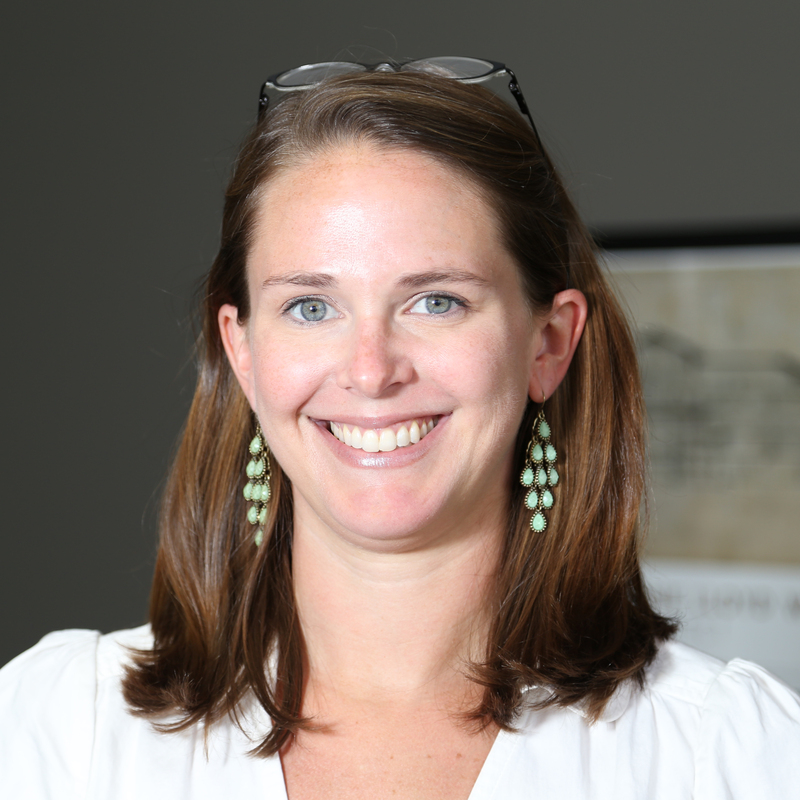 Demonstrate the positive role BlueCross plays in improving health in Tennessee. The last one is the ultimate goal, and one we measure all of our success by. In order for great stories to matter, people have to find them, so Better Tennessee prioritizes clicks above all other metrics. We want to get people to our site, engage them with a story, and spur them to follow us, comment or share — and do that more than once. The vast majority of our social posts use links or cards with images to make clicking through easy. We use original photography and keep branding consistent so people get used to seeing us in their feeds. We customize posts by platform for optimal image size, length and hashtags. If the featured image isn’t conducive to social or won’t meet promotional guidelines (i.e. Facebook’s ban on images with 20-plus percent text), we create custom social-friendly images. 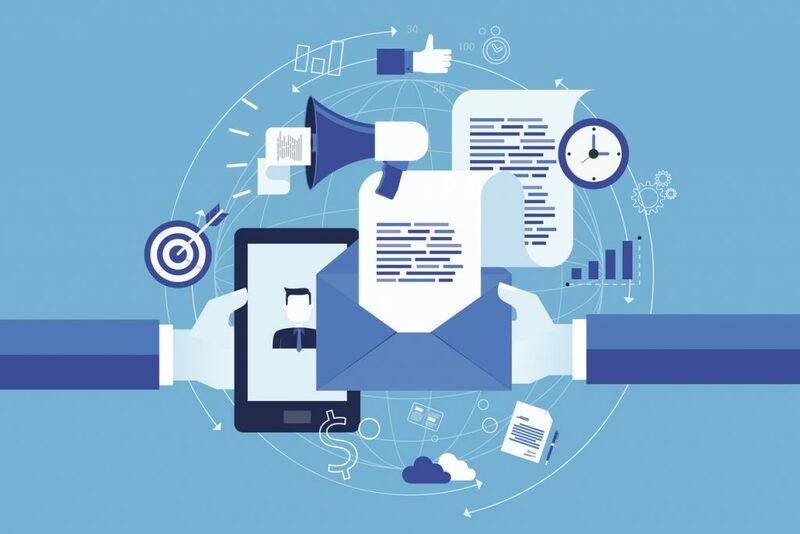 Above all, we write posts in a straightforward way while holding back enough information to get people to click through. We promote our posts (roughly 3/week) with ad dollars ($100/Facebook post and $75/tweet) because we’ve found it’s best to keep comments and clicks for a story in one place to boost ROI, engagement and credibility. We align our content calendar with awareness days and target each post differently to avoid burnout — some to fans, some to fans and friends, and some to completely custom audiences. 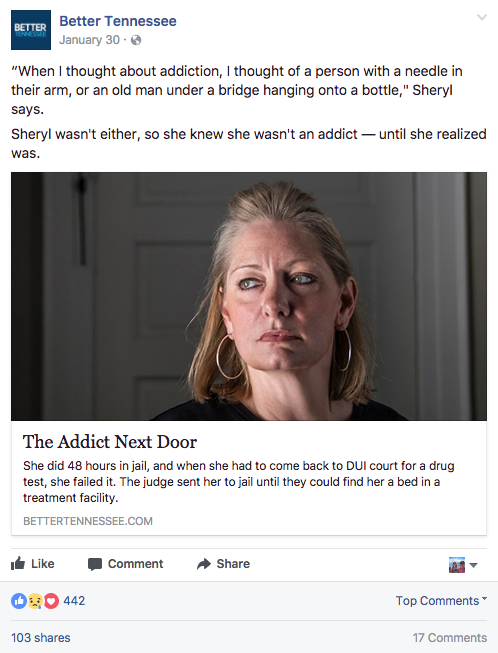 For example, a story on a new mother who’s recovered from addiction could be targeted to neonatal care professionals in Tennessee who treat babies affected by opioids, people in recovery and new moms. We geotarget all of our posts to Tennessee to keep our focus on the people we want to reach, and we get specific by city when applicable. 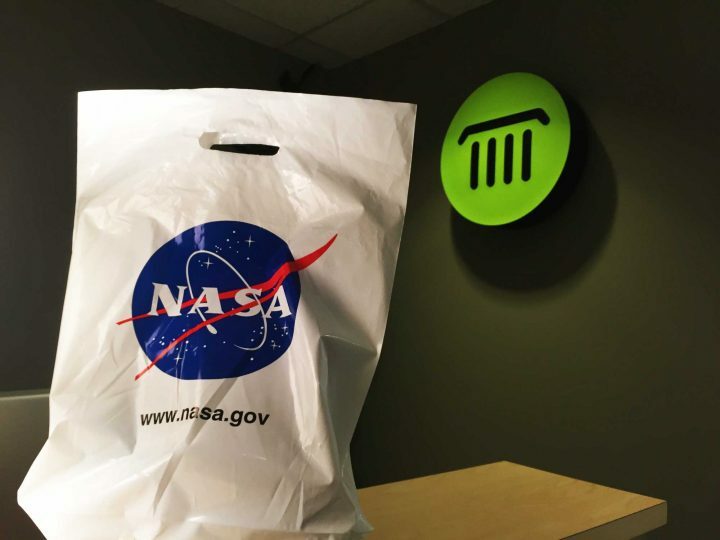 We repurpose each piece of content multiple times. Many are feature-length stories, so we embed hidden anchor links to drive people to a specific point of entry. For example, if we’re talking about multiple sclerosis within this larger healthcare clinic story, we direct people here. We also use different editorial angles for different audience segments, which extends the life of our copy. With a more shocking image that takes on the viewpoint of one person who’s suffered extreme loss. After we’ve posted a story, we monitor it daily, answering questions and providing data quickly, which our audience finds valuable. If a campaign is performing well, we re-boost to maximize its currency. If it isn’t performing as expected, we switch targeting to another audience or, if it’s already targeted tightly, loosen the parameters for a broader scope. We also focus on retargeting, or getting new content to people who’ve engaged with similar content in the past. 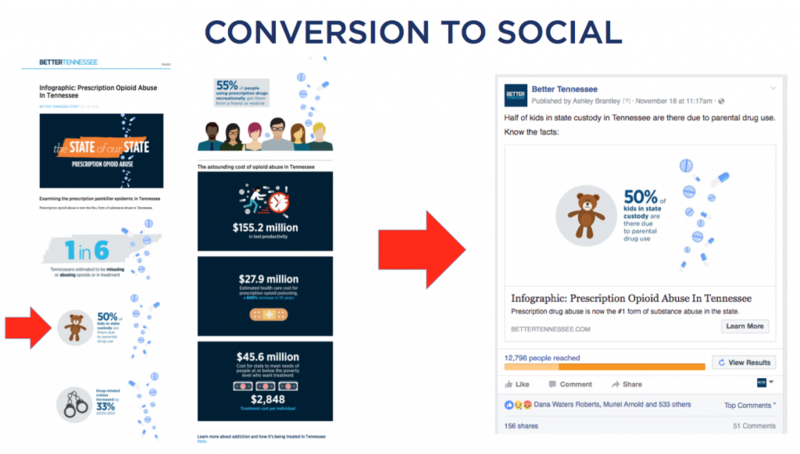 On Facebook, we do this with saved audiences (i.e. NICU nurses and opioid-related items mentioned above) or with lookalike audiences, which allow us to target users like our own who don’t yet follow us. On Twitter, we use Tweet Engager targeting, which allows us to select people who engaged with specific tweets to serve them new, related content. We also retarget based on website visitors and focus on fans/friends at least once per week to keep people engaged. In order to grow, we run follower campaigns monthly on Facebook, using Twitter as an organic benchmark (ROI is markedly better on Facebook for clicks but we want to maintain a presence on Twitter). We A/B test images and text, and we target influencer audiences with precision. For example, we might run a campaign targeting people who are 26-plus (the age when a person can no longer be on their parents’ insurance) who have an interest in health-related causes and nonprofits. We also form partnerships with BlueCross-supported organizations and run targeted campaigns. With GoNoodle, we crowdsourced teacher success stories from around the state. Both we and GoNoodle (34,000 Twitter followers) pushed out the tweet to our social channels, boosting our followers, engagement and responses, which we then published to our website. We promoted that second results story, as well, retargeting the readers and teachers who submitted. Of the 430,000+ website visitors Better Tennessee has received, roughly 30% consistently come from social media. On Facebook, we’ve achieved particularly high ROI. 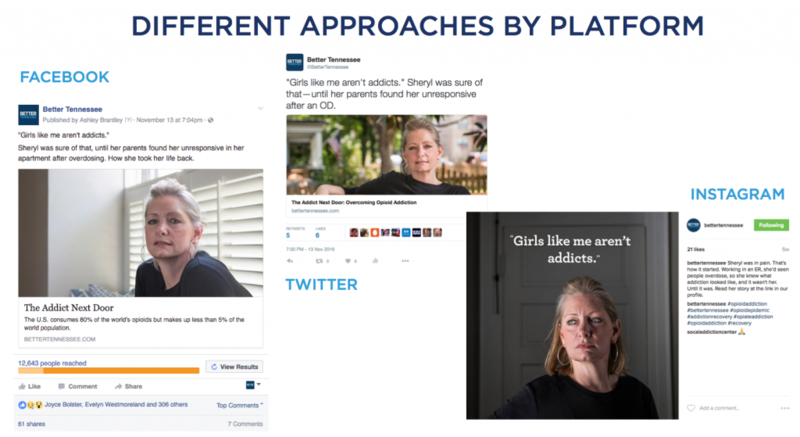 For example, a story about one woman’s struggle to overcome addiction had a cost per click of just $0.05. 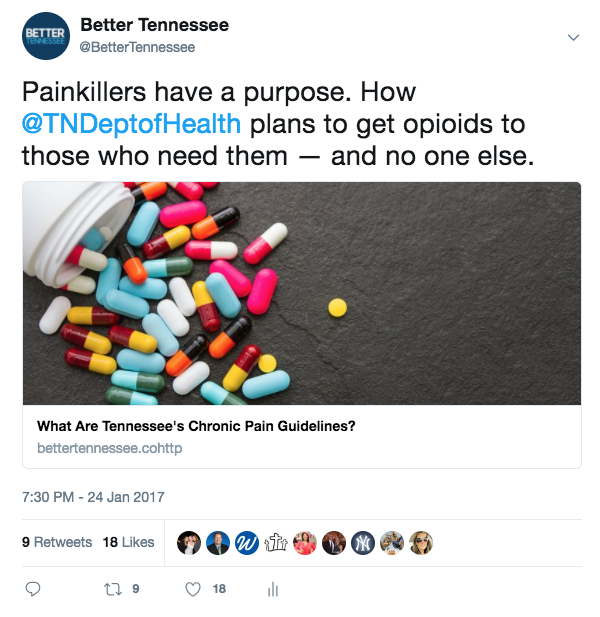 A second piece from the opioid-related cover package was this tweet about the Tennessee Department of Health’s thoughts on opioids, which cost $0.69/click. 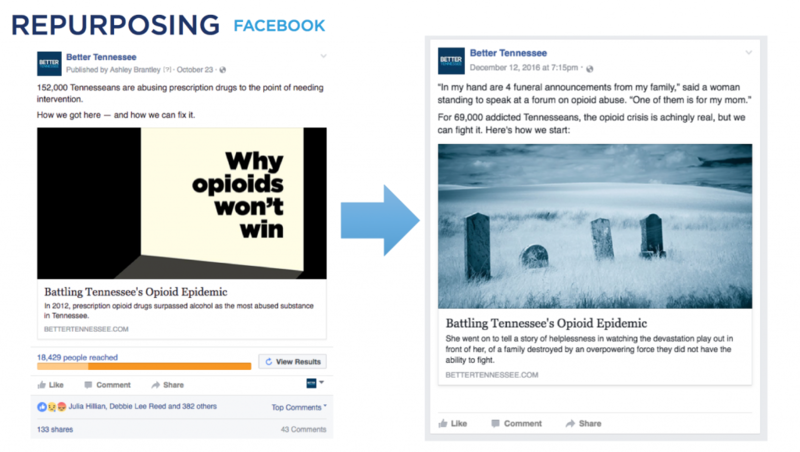 The Better Tennessee social strategy is always changing, but a focus on storytelling and engaging readers in a way that makes them want to revisit our content is always at the center. Showing the positive role BlueCross is playing to improve the health of Tennesseans.